This is SystemStar's main window as it initially appears (assuming you skip over the Create Estimate Wizard). The main window displays all of the data related to the current estimate and current component. 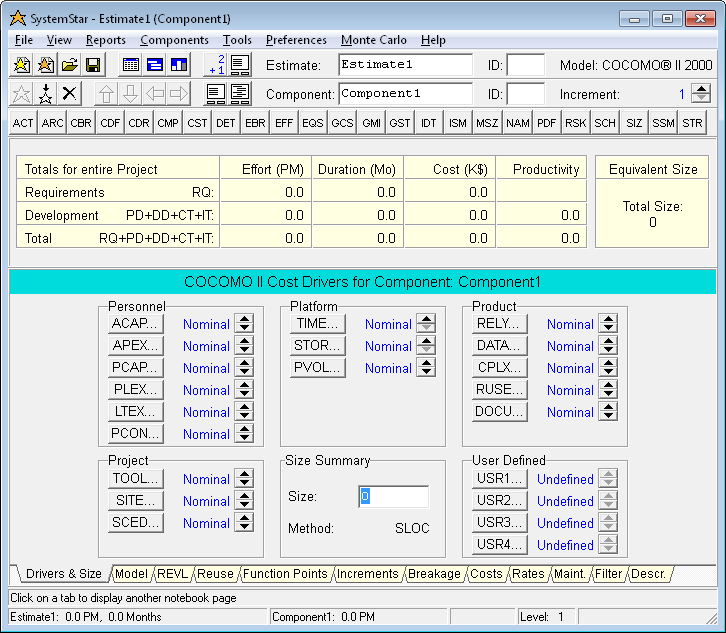 SystemStar automatically creates an estimate named "Estimate1" with a single component called "Component1". The new estimate takes on default values from the default model (COCOMO II.2000). The most important features of this window are 1) the menus, 2) the estimate toolbar, 3) the component toolbar, 4) the Automatic Estimation panel, and 4) a tabbed notebook .